As Thanksgiving approaches, we think about what we're grateful for. 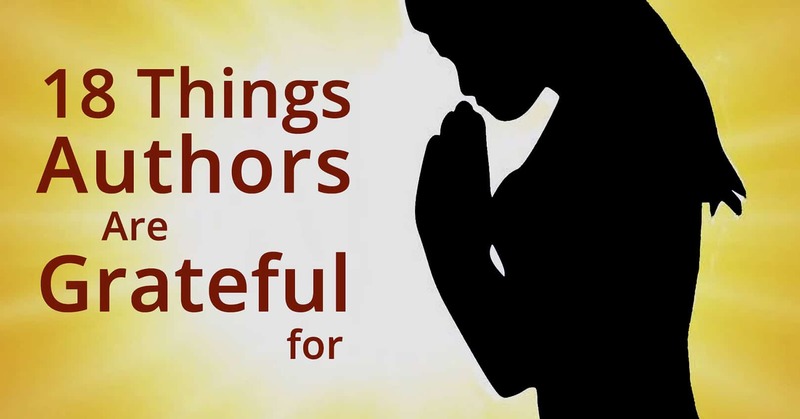 Here is our list of 18 things authors are grateful for. 1. That good ol’ backspace button. 2. Undo buttons—because we can’t mention the backspace button without mentioning undo buttons. 3. Being able to work from home: we can dress down and aren’t forced to have a conversation with a (real) person. 4. Fuzzy slippers—sitting at a desk all day results in cold feet! 5. Preschool because without those free hours, we wouldn’t be able to meet our deadlines, let alone stay sane. 6. Caffeine because, you know, writing deadlines. 7. Friends that let us write them into our novels (do they really have a choice?). 8. The Internet. Need we say more? 9. For computers, because even we have trouble reading our own handwriting. 10. Mismatched socks—it’s a great way to express creativity! 11. Being able to do something that we (most of the time) love. 13. Books, for when we need to take a break from writing. 14. Netflix, Hulu, and TV for kids—we can get a lot of writing done in the time it takes for our kids to watch just one episode of their favorite show. 15. Family who doesn't mind when we disappear into our caves to write. 16. Readers who give us a reason to continue writing, even when we have no idea what we're going to write next. 17. Villains, who let us express our darker side. 18. Spell check—because while we’re pretty amazing, we’re not perfect (yet). Can you think of more things authors are grateful for? We'd love to hear in the comments below! If you'd like to learn more about Book Cave author promotions and other marketing ideas, please enter your email below and click the "Learn More" button to receive our author newsletter. Reuse notice: Non-commercial users, feel free to print out "18 Things Authors Are Grateful for" for personal use or give to friends, share online, or make a meme of, as long as you attribute and link back to us. Commercial users, you may share a link to this post or quote a short excerpt from it with attribution and a link to this site, but you may not use this post in its entirety. Thank you for caring about copyright.